One of the more interesting phenomena of the present day is to note the number of books issued from secular book houses that deal with Biblical themes. The present volume, under review, is no exception. It is entitled God’s Bestseller, authored by Brian Moynahan and published by Saint Martin’s Press. At first blush, the title conveys the idea that it is a book about the Bible but we get the true gist of the book by its subtitle: William Tyndale, Thomas More and the Writing of the English Bible. A story of martyrdom and betrayal. 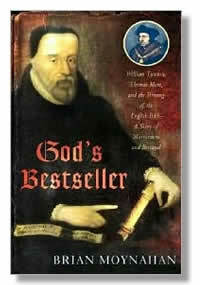 Thus, it is a book that deals with the translation and printing of the English Bible carried out by William Tyndale. However, the real story of the book is the account of the betrayal of Tyndale and his death by strangulation and burning in October 1536. It is a fascinating read and one can learn much from its content. Moynahan sets the book in its proper context by recounting the history of the first translation of the Bible into the English language through the work of John Wyclif. He relates that after the death of Wyclif in 1384 as an orthodox member of the Church of England, the English clergy banned vernacular translations under the Constitutions of Oxford of 1408. Wyclif himself was declared a heretic by the Council of Constance that met in the years 1414-18 in the German city of the same name. Finally, in 1428, on the express orders of Pope Martin V, Wyclif’s bones were disinterred, his skeleton chained to a post and burned. This penalty could be executed on the body of a dead person because the penalty for heresy could be inflicted even after the death of the individual. However, how could this penalty for heresy be executed at all? Moynahan tells in vivid detail that even before the decision to ban vernacular translations of the Bible, a statute for the burning of heretics had been enacted in 1401. The first person to suffer death by burning in England was a Lollard, or follower of Wyclif, named William Sawtry. The enactment in England of the civil punishment of heresy had its roots in the Fourth Lateran Council of 1215 convened under Pope Innocent III. That council decreed that heresy could be punished by the civil authorities and the highest punishment was death by fire. Heresy was considered so terrible that the penalty could be inflicted beyond the grave as we noticed above. This is the context for the telling again of the history of the English Bible. However, Moynahan is not only interested in the recounting of Tyndale’s activities in translating and printing the Bible which he does in a straightfordward and compelling manner, he looks behind the scenes to discover those who were plotting the death of Tyndale. It is important to remember that heresy was being prosecuted with a vengeance during the time that Tyndale was abroad and involved in translation work. A number of notable persons including Thomas Bilney, Thomas Hitton, Richard Byfield, and Richard Bainham had been convicted of heresy and sent to the stake. Perhaps the most notable person sentenced to death was John Frith, a friend and co-worker of Tyndale who was burnt on July 4, 1533. His death was a cause celebre because he had been one of the Cambridge students chosen by Thomas Wolsey, Lord Chancellor and Papal Legate, as one of the first scholars of Cardinal College established by Wolsey at Oxford in 1525. Many attempts were made to save Frith but when he put into writing his rejection that the Eucharist was the true body and blood of the Lord, his fate was sealed. Behind the deaths of Frith, Bainham, and Bayfield was the person who replaced Wolsey as Lord Chancellor, Sir Thomas More. Moynahan rehearses the life and career of More, but perhaps he does his best work in showing aspects of More’s character that belied the urbane author of the Utopia. More was nothing if he was not a fanatic for the preservation of the old religion. He detested heresy and heretics with a malice that is difficult to reconcile with the familiar irenic descriptions of his character. While More was persecuting heretics in England, he was also engaged in a malicious dialogue with William Tyndale on the continent. More attacked Tyndale with a savagery that nearly defies description. There was almost a pathological enmity that More bore toward anyone who could even be remotely suspected of holding heretical ideas. However, Tyndale was not merely suspected of harboring heretical ideas, he had expounded them in his book The Wicked Mammon, an exposition of the doctrine of justification by faith. However, the supreme error of Tyndale, according to More, was to translate the Bible into the English language. We must keep in mind that the Constitutions of Oxford that forbid such vernacular translations were still on the statute books and thus his translation was illegal. Even as More was engaged in his war of words with Tyndale, attempts were in process to bring Tyndale back to England under a safe conduct. Thomas Cromwell engaged Stephen Vaughn to contact Tyndale and persuade him to return. In the event, Tyndale said that he was willing to come back if King Henry VIII would permit the Scriptures to circulate freely. This the King was not willing to promise and as a result the negotiations failed. At this point someone made a decision to employ an individual by the name of Henry Philips to go to Antwerp, befriend William Tyndale, and betray him. Philips, who is one of the most unsavory characters in human history, agreed to do this. He was in deep financial straits because he had gambled away monies entrusted to him by his father to settle a debt. The question that has engaged historians over the years has been to identify the person who employed Henry Philips to betray Tyndale. Several persons have been suggested in addition to Sir Thomas More. They include King Henry VIII himself due to his frustration of persuading Tyndale to return to England. Another individual whose name figures prominently in the drama was John Stokesley, the Bishop of London who replaced Cuthbert Tunstall when he was translated to the See of Durham. Stokesley, who now held one of the most powerful posts in the Church of England, was inexorable in his persecution of those whom he suspected of heresy. Still another person who has been included among the possible employers of Philips was Steven Gardiner, the Bishop of Winchester who also was noted for his cruel treatment of those suspected of heretical tendencies. However, Moynihan dismisses Henry VIII, Stokesley, and Gardiner as being responsible for the hiring of Henry Philips. He seeks to prove beyond any doubt that only Thomas More had both the animosity and means to employ Philips. Moynahan lays out a strong case to substantiate his claim. We will not rehearse all the details of Philips’ actions. It is a sordid tale of one who was willing to do anything for the sake of gain. However, coupled with this avarice was a deep detestation of Tyndale. There would not seem to be any reason why Philips should bear such malice to a fellow human being but it appears that such was the case with him. It was not only that Philips betrayed Tyndale after Tyndale graciously accepted his offer of friendship, but his subsequent actions as listening in, although out of sight, at the examinations of Tyndale, his accusation of Thomas Ponytz who labored unceasingly and, unfortunately unavailing, to free Tyndale, and other actions reveal him to have been a person of deep seated malice toward William Tyndale. Although this lies outside of the scope of the story and Monahan does not deal with it in detail, perhaps the reason why Philips bore such a deep seated malice to Tyndale was because Tyndale was everything that Philips was not. Whatever one may think of William Tyndale, the Inquisitor-General of the Low Countries called Tyndale a good, learned and pious man. Such could never have been spoken of Philips; the epithet of Judas is probably the most accurate description of him. Moynihan follows the story to the end dealing with Tyndale’s betrayal, imprisonment, and martyrdom in October 1536. If indeed Sir Thomas More was the individual responsible for the betrayal of Tyndale, his triumph was short-lived. More himself died in the same year as a traitor to England because of his refusal to acknowledge the legitimacy of Anne Bolyn as Henry’s wife and the refusal to acknowledge Henry as the Supreme Head of the English Church. Certainly he died for bravely for his beliefs. However, if he were indeed the ultimate betrayer of Tyndale, it leaves a stain on his character that cannot be effaced. More did much for English literature when he penned Utopia but Tyndale gave the English people the Word of God in their own language. Perhaps, this as much as anything highlights the differences between the two men. Wow, that looks very interesting! Especially the part about Wyclif’s bones being burned after death as penalty for heresy! I just don’t understand how Moynahan can have a plausible argument suggesting More was specifically involved Tyndale’s death, but you seem to accept it as possible, so maybe you can help me understand. More resigned in 1532, thus ending his legal powers. He was imprisoned in 1534 and executed in 1535. More died a year and a half before Tyndale. How could Thomas More be held responsible for hiring anyone and implicated in the 1536 death of Tyndale? When I read God’s Bestseller, I see it as an author trying too hard to draw a black vs. white distinction.